Last update (Jul 15, 2009): Focus Speed: Olympus E-P1 with Lumix 14-140mm lens attached, indoors. Professional and user reviews, owner opinions and experiences, tests, ratings, conclusions and feedback. The Panasonic 14-140mm lens was introduced on 3-May-2009, and has a focal length range of 28-280mm in 35mm terms. The 14-140 is optimized for use with Micro Four Thirds cameras such as the Panasonic Lumix DMC-G1 and GH1, and, according to the announcement at DPReview, features “… a new silent focusing system which allows continuous AF during movie recording and a stepless aperture control”, making it suitable for video recording. Weight: Approx. 460g / 16.23oz. Dimensions (measurements): 70mm diameter x 84mm (2.76 x 3.31 in). Minimum (closest) focusing distance: 0.50m / 1.64ft at all focal lengths. Maximum magnification: Approx. 0.2x / 0.4x (35mm film camera equivalent). Filter thread size (diameter): 62mm. Watch in HD on YouTube. Test pictures showed the review lens to have no evident rectilinear distortion and exposures appeared even across the entire frame. Lateral chromatic aberration was consistently negligible throughout our tests and we found no evidence of coloured fringing when test shots were enlarged to 100%. Bokeh was attractive, particularly at longer focal lengths. All the photos in this DPReview gallery were taken with the 14-140 mounted on the Panasonic GH1. The full-sized photo was photographed with a Panasonic Lumix DMC-GH1 camera. The filter thread size on the Panasonic 14-140 is 62mm, which means you’ll want to be looking at 62mm filters. Standard (included) accessories are: Lens Cap, Lens Hood, Lens Rear Cap, Lens Storage Bag. 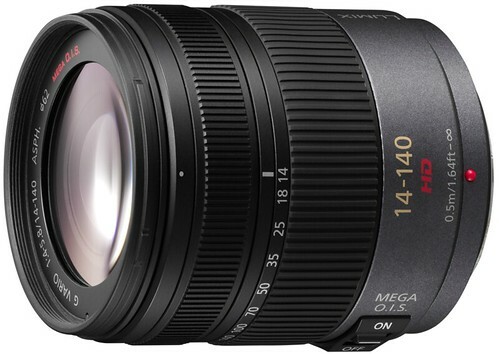 Official Panasonic 14-140mm website — More information on the lens can be found at Panasonic Global, which has technical data, specs, and MTF charts and a lens construction diagram.